That is my next question, I can build it into the form myself, but I do not know where to edit the form code. Email Address Identical Check In Form looks promising but I'll need to test it first. Your form should now work pretty much like this one. If it doesn't, please let us know. Wow, you guys are awesome! Thanks a lot for the extra help! I am trying out the changes suggested, and editing the code in the form is easy enough. I have a saved copy of the code with the e-mail verification changes. I downloaded the compressed and refined version with seperate .css and .js files and was going to put the form in a wrapper on my Joomla website... however when I did that the form in the export is not an SSL form.. Put simply, I have the form verifying the e-mail. Now I need to be able to place it on my website with SSL. Any ideas? 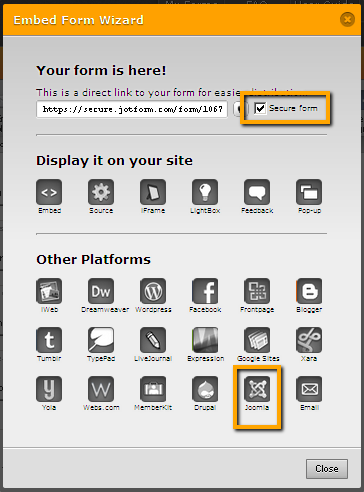 Have you tried using the Joomla embed code in the Embed Form Wizard as shown below? 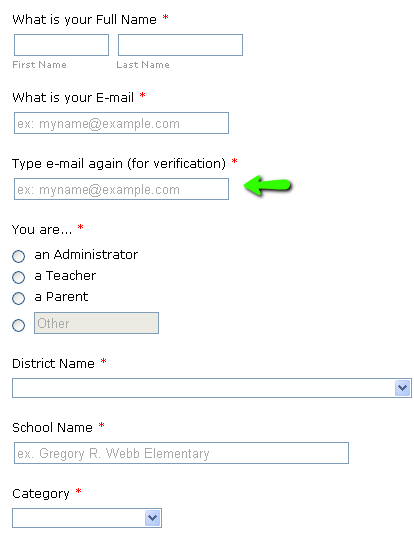 Make sure that the Secure Form check box is also checked to make the URL secure. Please try it and let us know if it works for your site or not. But if I do that, the custom code (that was provided by abajan above) I have added to the form for the e-mail verification isn't there.. ? 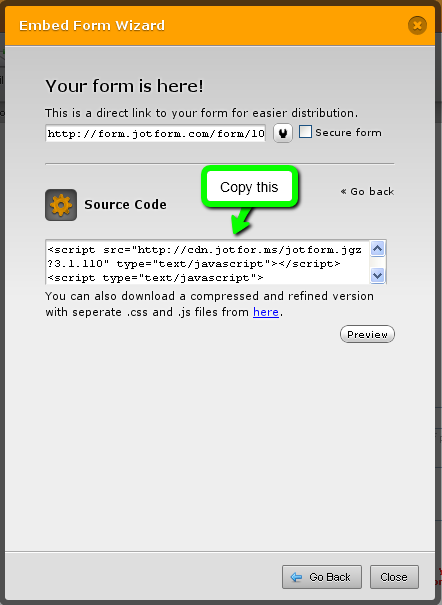 Is there a way to edit the source code in the form and save it on JotForm? We hope you find this information useful. Let us know if you need further assistance.